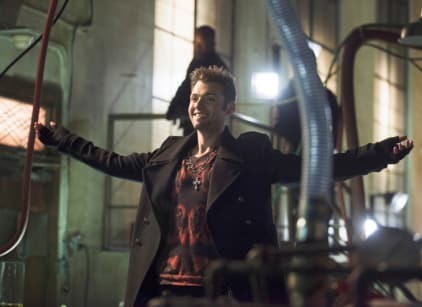 In a flashback to the earthquake, we learn The Count broke free from prison on that day and he makes his return to Arrow this week. Laurel is angry that Adam is holding things back from her before Moira's trial. She spots Oliver as they walk into the courthouse. Diggle seems to have the flu, and Oliver tells him to go home. After opening statements, Diggle is at the office with Felicity and she asks if he got the flu shot and faints. The Count meets with a doctor who asks for more money, and The Count injects him with something. Diggle has traces of Vertigo in his bloodstream. Officials worked overtime to keep the lid on The Count's escape. The DA starts to act strangely while questioning Thea. He then passes out. FLASHBACK: Dr. Ivo is with Oliver on the island. They are looking for a "hosen" arrow that was with dead bodies. While they are trying to make Oliver talk, Shadow and Slade show up, bows in hand. Moira's attorney tells her that Thea's testimony was damaging and she will have to testify on her own behalf. Felicity gave Diggle a Vertigo antidote, but it doesn't work. The Count must have changed the formula. The Count shows up on the city's screens, holding Adam hostage and says all they have to do is show up to their nearest Vertigo dealer to request the fix and they'll feel better. Adam says he wants it and The Count injects him on camera. Laurel is made lead counsel on the Moira Queen case. Roy takes boxing gloves to Thea and gives her a way to let go of her pain and aggression after the trial. Laurel goes to Moira with Adam's "trump card" in her case, asking her not to take the stand. She shows her the information and says forget about what it will do to Oliver and Thea but not to let it undermine her entire case. The Arrow breaks into The Count's lair and frees Adam without killing anyone. Moira comes clear with her children about a brief affair with Malcolm Merlyn and Laurel cross examines her on the stand so that it seems that there is no way she could have been afraid of him. After determining people are being dosed with Vertigo by flu vaccine, Felicity boards a flu van on her own and The Count is there. Moira's attorney tells the kids the jury is near a verdict, and to expect bad news. The Count, with Felicity in Queen Consolidated offices, tells Oliver he knows he is The Arrow and Oliver shows up to save her without his hood up. Just before The Count injects Felicity with Vertigo, Oliver kills him. Moira is found not guilty. Felicity apologizes to Oliver for putting him in the position to kill. FLASHBACK: Sara tells Oliver what is on the submarine and Oliver asks if it can save Slade. Brother Blood's "henchmen" seem to have come through their training stronger. Moira isn't taken home, but to an empty parking lot where she is greeted by Malcom Merlyn. He was overjoyed that Thea is his daughter. I made a choice not to put an arrow in this guy, and it was the right choice. There's no more killing. Mom, secrets are what put you here. Secrets and lies. Now is the time to give the truth its day. Arrow Round Table: "State v. Queen"